The poll tax was never far away from the news locally but this time the news was very significant. One local resident, a Mr Ashworth, had been jailed for 14 days for non payment. That was in September 1991 and he served six days before being released on appeal. That appeal was heard and a High Court judge quashed the prison sentence although the court refused to accept the initial application. The judge admitted that his decision was based in part on Burnley Borough Council leader Ken McGeorge's comments on the BBC Radio 4 programme 'You and Yours'. On air, Mr McGeorge said: "It doesn't give me any satisfaction to be sending people to jail for non-payment. However, we have hesitated to send the bailiffs in to seize goods, consequently we have missed that avenue simply because we really didn't want to take it." The judge said that left him with no alternative but to quash the sentence and send the case back to Burnley. Mr Ashworth would now have to go through the whole process again and appear in front of the magistrates in Burnley. It was all kicking off at Habergham High School but it was the teachers and not the pupils as they took sides on whether the school should opt out and move into grant funding. The local MP Peter Pike had just about demanded that parents vote against it whilst prospective Conservative candidate Brenda Binge was all for it. Binge branded those against the opt out as a noisy caucus and said: "I have asked in the past, and I ask again. From what are these people saving the school? Perhaps I ought to start a noisy caucus. I'll call it 'Save Habergham from the regressive ideas of the Burnley Labour Party." Teachers against the move were out and about in town petitioning. They got 700 people to sign their petition. However, those teachers in favour of opting out had to remain silent. They couldn't be open or put pen to paper because, unlike those against grant maintained status, they did not have the authority's backing or political support in the form of funds. It all made a change from my days at that particular school when any arguments and fights tended to between pupils and not the teachers, and the pupils didn't bother with petitions or votes either. The police were on the lookout for a man of around 19 who mugged 72-year-old Mrs Doris Perkins in Browsholme Avenue close to Turf Moor. In his attempts to steal her handbag he knocked her to the ground and dragged her for several yards. Doris was rushed to hospital where she had to receive emergency surgery to remove a blood clot from her brain. Before moving on to sport, there was news for dog owners in town, especially those whose dogs weren't the best behaved. Burnley Dog Club had launched courses in dog obedience. Jill Fawcett, on behalf of Burnley Dog Club, said: "Even old dogs with bad habits can still be taught good ones. Classes are very sympathetic to the animal with the dogs and their owners having a lot of fun." So you can teach old dogs new tricks, and to prove it there were 18 dogs on the first course with 10 of them passing with flying colours. so well done to those who passed. They were Max, Mitzi, Scamp, Pip, Chrissy, Sabre, Toby, Jeff, Polly and Tess. Well done to 17-year-old Mark Harvey who had won himself a two year contract with Lancashire County Cricket Club. He became the first player from Burnley Cricket Club to join the county since opening batsman Bob Entwistle in the early 1960s. Burnley were hoping he'd be able to continue playing for them in the first half of the season before joining Lancs at the beginning of July. In football, it had been a black weekend for former Claret Derek Scott. 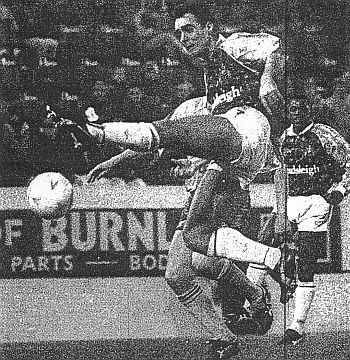 Playing for Burnley Bank Hall, the club with ambitions to challenge BFC, he received the first red card of his career. Scotty's game was cut short and so was Burnley's despite the fact we got through 90 minutes. 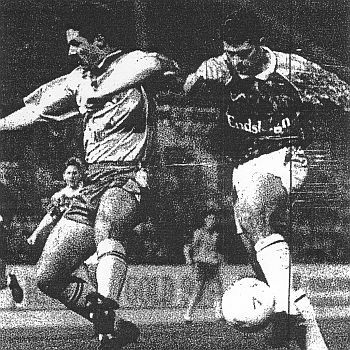 Ahead of the game, manager Jimmy Mullen hit out at the rumours suggesting a Turf Moor return for goalkeeper Andy Marriott, and called for an end to them. "These rumours are ridiculous and could end up damaging our promotion hopes," Mullen blasted. "People have got to stop talking about Andy Marriott. He had an excellent three months with us but now the deal is dead." He added: "I don't want a certain section of the fans to continue to believe that Andy Marriott is the be-all and end-all as far as goalkeepers are concerned. Of course I have tried everything I can to bring him to Turf Moor, but the situation has not changed and the deal is dead." 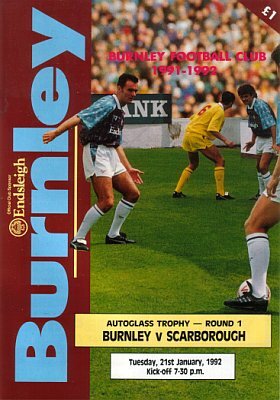 Maybe Burnley's Autoglass Trophy game should have been dead too. It was a cold night at Turf Moor as we locked horns with Scarborough. It was a game we should have won, no doubt about that. We forced ten corners during the game and had ten shots on target but found Phil Hughes, later to become our goalkeeping coach, in inspired form. However, conditions worsened during the game and when Holbrook, from Walsall, blew his final whistle with the score at 0-0 he decided against extra time, a decision that he agreed with both managers. Mullen said afterwards: "During the last 30 minutes the pitch just got harder and harder. One of their players along with Ian Measham and John Pender picked up knocks because they lost their footing. There's no way that could carry on. "If a player had fallen over and banged his head it would have been like hitting concrete. There's no way that was safe." The Burnley team was: Chris Pearce, Ian Measham, Joe Jakub, Steve Davis, John Pender, Andy Farrell, Steve Harper, John Deary, John Francis, Mike Conroy, Graham Lancashire.